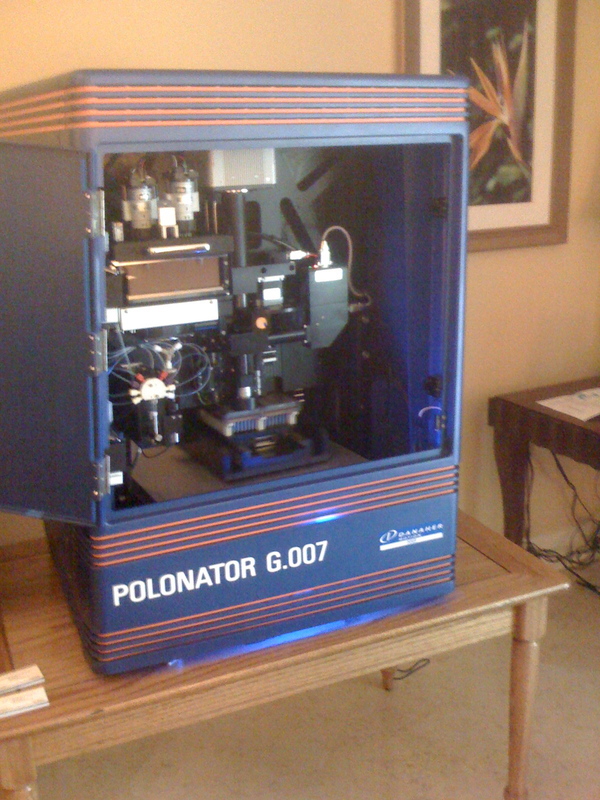 Without a doubt, the coolest thing at AGBT/Marco Island is the Polonator. This is a new sequencing system build by Denaher Motion based on the polony method from George Church’s lab. Now I have no idea if this machine even works. And even if it works, I have no idea how useful it will be. But the idea is brilliant and appealing. They are trying to be an “Open Development” Massively High Throughput Sequencing system. By Open they mean, they will use open source software (and would love developers to help) and will use non proprietary reagents and supposedly try to make everything as cheap as possible. They will still make the main piece of equipment and I assume this is what they hope to make money off of. I went to a showing in a room nearby the seminar room. There were many skeptics there. Most were concerned about the read lenght coming from the machine. But it should get better. And if the price is a lot less for reagents and the machine than anyone else’s system — this could be an important player in the market. Author Jonathan EisenPosted on February 8, 2008 April 10, 2017 Categories Misc.Tags Misc. What read lengths are they currently getting? they said 26 bpSince they do mate pairs that is 13bp per tagThey are working on making it longer…. Next Next post: Marco Island sequencing frenzy – are we getting lost in all the data?